The Frankfurt Motor Show last September heralded the arrival of BMW’s most advanced sport cars ever offered for sale. The future of the supercar arrives here this month with a starting price from €136,430 on-the-road. It includes a €2,500 VRT relief and a €5,000 SEAI grant. The BMW i8 is a plug-in hybrid performance vehicle that uses a three cylinder turbocharged petrol engine, with a 1.5 litre capacity, in conjunction with an electric motor to provide searing acceleration but in a package that takes BMW’s EfficientDynamics philosophy to a new high, delivering 155mph, yet posting just 49g/km and 135mpg figures in the process. Torque is electronically limited at 570 Nn. 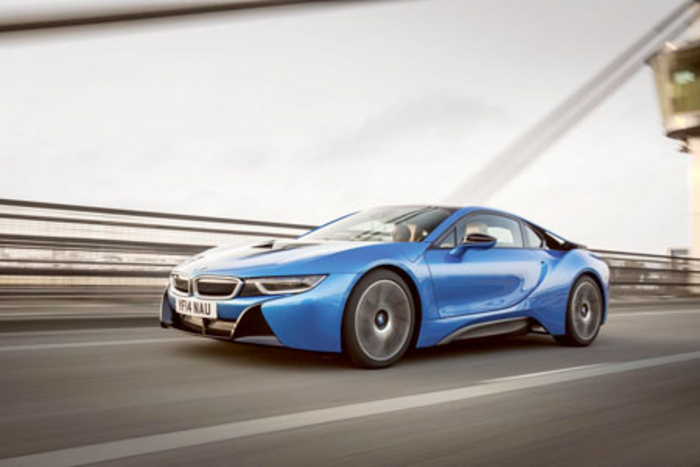 The i8 offers you zero to 62 mph in just 4.4 seconds. And for peace of mind, the BMW 360° Electric provides a unique package of assistance and mobility solutions. The design of the BMW i8 brings together hallmark BMW dynamics, lightweight design and efficiency. The 2+2-seater is immediately recognisable as a BMWi model and a new generation sports car. A length of 4,689mm, width of 1,942mm and height of 1,298mm give the BMW i8 typical sports car proportions. Its dynamic character is also reflected in its long bonnet, clearly visible aerodynamic aids, stretched roofline, short overhangs and long, 2,800mm, wheelbase. The car’s wide track (1,644 millimetres at BMW the front axle, 1,715 millimetres at the rear ) completes the powerful dynamic presence generated by the car’s proportions. More on the i8 later, including how ConnectedDrive features as an intrinsic part of the car’s connectivity. Supercars will never be the same again!